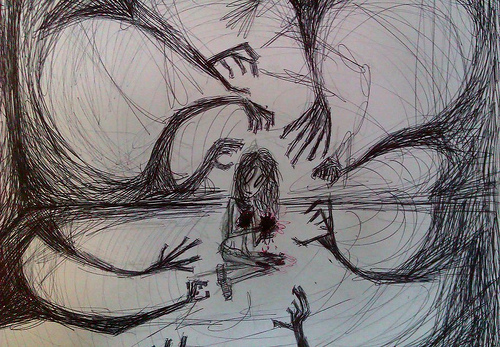 Nobody likes to feel small, ignored and powerless. Smart marketers understand this, and use the knowledge to make suckers out of us. I’m talking about a sales technique that I was taught many years ago. It’s called MMFI. This is a post about how it works – with examples of a couple of big brands that are using it right now. In a number of previous posts (From USP to UPS and Sold on you) I’ve explained how many shrewd brands, struggling to establish any meaningful point of difference, take the emphasis off the product. For example, when Kentucky Fried Chicken recently ditched their famous slogan of fifty years for “So good”, Martin Shuker, chief executive of KFC UK and Ireland explained, “‘Finger lickin’ good’ is very good but it’s very food-centric”. Come to think of it, they now refer to it as KFC, dropping other food-centric words like fried and chicken. Especially that “f” word…doesn’t sound terribly healthy, methinks. So, many brands are adopting marketing campaigns that are less product-centric and more consumer-centric. Instead of promoting the tangible features of their products (which may be rather unremarkable, if not downright off-putting) they shift the focus onto the heart of the consumer and start promising benefits that are purely emotional – they concentrate on pushing a vague feel-good factor. The ultimate driving machine no longer dwells on the hard facts of cold Germanic engineering but now promises “joy”. L’Oreal pushes enhanced self-esteem with “because you’re worth it“. And Norwich Union (now Aviva) moved on from selling mere car insurance and came up with “Quote me happy”. Brands like Aviva are now in the business of spreading happiness. That, however, is a bit of a challenge. Because, as I mentioned at the start, nobody is happy about feeling small, insignificant and powerless – which is exactly how one tends to feel when dealing with big financial institutions. And Aviva is big. It’s the sixth largest insurance company in the world, with 53 million customers. That’s more than the entire adult population of the UK – so as an individual customer the truth is you are small, insignificant and powerless. 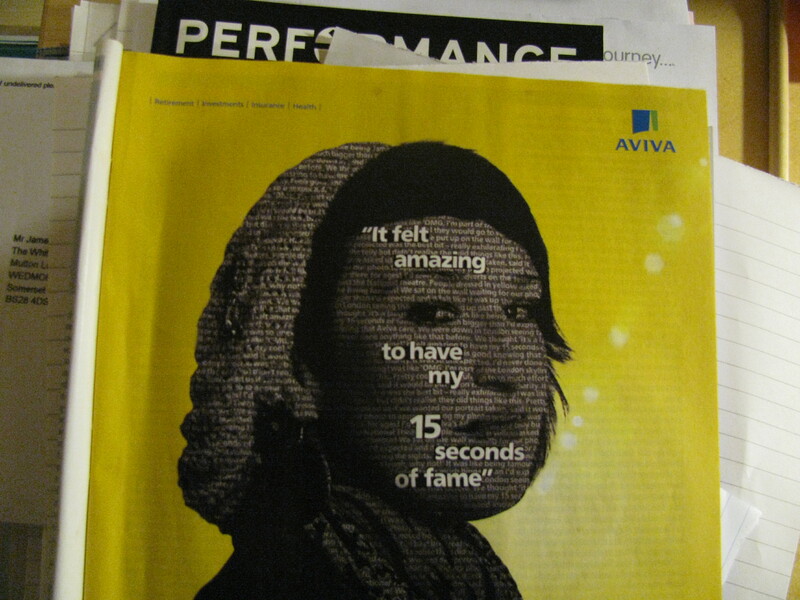 So what do the clever people in charge of Aviva marketing do? Dismantle this perception by using the MMFI formula. I was taught this technique when I went into multi-level marketing. I found it was a hard sell – but I also discovered the success rate was a lot higher if people liked you. Best way to get people to like you? Build them up and make them feel good about themselves. 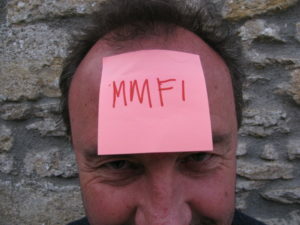 The way you did that was imagine that the person you were talking to had the letters MMFI stuck on their forehead. What does MMFI stand for? Make Me Feel Important. 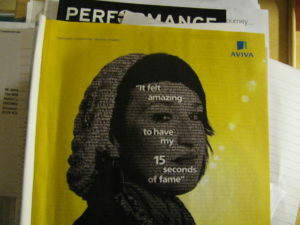 That’s why Aviva recently launched the “You are the Big Picture” campaign. They invited individuals to upload a photograph of their face, along with details of “what matters to them most” to Facebook.co./Aviva. For every image they receive they donate £2 to Save the Children to support Aviva’s Street to School programme. They also gave people the chance to have their image projected onto London’s National Theatre from 6 – 15 October, 2011. One of them, Laura Seddon from Coventry, was also featured in a full page ad in The Economist. The headline “It felt amazing to have my 15 seconds of fame” was superimposed on her face. What’s the message? That we make people feel important – big, significant and powerful. At the time of writing 49,388 people on Facebook liked it (who wouldn’t?!). With my marketing head on I can see exactly why they’ve done it. With my consumer head on I think it stinks. It has absolutely nothing to do with insurance – it’s just an extremely sinister and manipulative way of preying on naive people who are crying out for attention. But then I’m just a grumpy old cynic. What do you think? British Gas (an account I worked on when I was at Young & Rubicam) is another advertiser that is using the MMFI angle to good effect. For several years they’ve been running their “Looking after your world” campaign. The intention with this campaign is once again to counter the perception that, as a single customer amongst many, you are small, insignificant and powerless. The TV commercials and press ads feature the reassuring line that “at British Gas we know that your home is your world”, and shows an individual family, their own planet filling the page or screen, with everything else orbiting around them. The clear subliminal message is “you are at the very centre of the British Gas universe”. But what’s the reality? Your little planet is one of almost 16 million households (over half the homes in Britain are customers, and the number increased by 400,000 since 2009). What’s more, in July this year Centrica, who owns British Gas, unveiled a profit of £1.9 billion, raised some domestic prices by 18% and increased its dividend to investors. Furthermore, in April 2010 it was also revealed that Frank Chapman, the chief executive , took home £28m in cash, shares and pension contributions the previous year. What does that tell you? That the directors and shareholders are the true masters of this universe, while individual customers are about as significant as the specks of dust in the rings of Saturn. So, is this “looking after your world” campaign harmless exaggeration, or shameless misrepresentation? And should advertisers be using our own hopes and fears in this way to keep us docile while filling their pockets? Jim - this is a BRILLIANT blog post that jumped out of the page at me... thank you! This is particularly pertinent to a number of key clients I'm currently trying to win round to this way of thinking and understanding, that are currently too inwardly focused. Thanks for super enthusiastic feedback - hope it helps you with the particular clients you have in mind! Fascinating and useful. I have been practicing this technique, ethical or not, for years– I just didn't know it. The benign way to look at it: rather than a company bragging about itself and telling you how incredibly fantastic it is (which would be obnoxious in a person, but in reality is the persona of many brands we're exposed to every day), the company instead focuses on the customer. I remember trying to sell in this notion to advertisers several years ago, and receiving only blank looks back. A client even told me in a fairly angry way, "You KNOW what we want. Talk about us!" In mild frustration one day, I submitted a headline which said, "Great rates. Great people. Great banking." I think that after making me put an exclamation point after Great Banking!, the client was literally overjoyed with the line--breaking out the champagne. An anecdote that doesn't have much to do with our topic, but does have a lot to do with conventional business attitudes vis-a-vis Advertising. So I kind of welcome the idea of a client talking about a customer, and making that customer feel important. I think how sinister these marketing campaigns are depends on how much effort the company puts in to their customer service. Is it just a come on line? Or do they really make it a company policy to put customers first? Yes, this notion that it's better for client to focus on the customer, rather than banging on about themselves all the time, is a real revelation to some advertisers (and hard to get them to accept). But then there's the more sophisticated ones (like the two I mention in this post) who not only get it, but use it in a rather cynical and manipulative fashion. So, I guess it's good to run ads that make the customer feel important, but only if the service matches up to the promise....which is the point you make Alexa (thank you!). Apologies to you all for being slow to post your comments...I've been painting windows and out buying building supplies most of the weekend. Great article, Jim. MMFI - I'll remember this now for my next job!